7/24 Cup of Coffee: Salem took home a big victory thanks to an impressive team performance. Portland lost in a tight game, and the PawSox will have to wait to finish their contest today because of rain. The Drive and the DSL Red Sox also took home big wins. The GCL Red Sox lost both halves of a doubleheader. The Pawtucket Red Sox's contest against the Lehigh Valley IronPigs (PHI) was shortened by rain with the PawSox leading 3-2. All five runs were scored in the fourth inning. 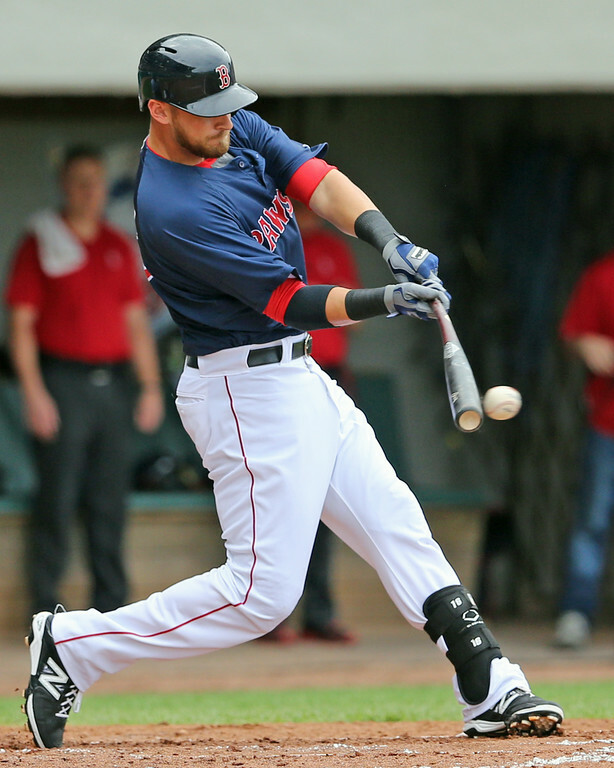 The PawSox scoring began with a leadoff home run by third baseman Will Middlebrooks (Pictured). Two singles and a walk then loaded the bases with no outs for shortstop Deven Marrero, who grounded into a double play but drove in one run. A Matt Spring double drove in the final run of the inning for the PawSox. PawSox starter Steven Wright gave up only two hits in 3 2/3 innings pitched. He struck out one batter. The game will be continued July 24. The Portland SeaDogs fell to the Binghamton Mets (NYM) 4-2. SeaDogs starter Mike Aguilera threw six innings yielding eight hits and four runs while striking out seven. The SeaDogs offense mustered eight hits: four of which came from third baseman Michael Almanzar, 2 for 4, and first baseman Ryan Lavarnway, 2 for 4. All four of their hits were singles. Second baseman Sean Coyle went deep in the game, a solo shot, for his 12th home run of the season. Coyle was 1 for 3. The Salem Red Sox routed the Lynchburg Hillcats (ATL) 12-3. Salem mounted a 15-hit onslaught against the Hillcats. The attack was led by third baseman Mario Martinez, who was 4 for 4 with two doubles, one RBI and three runs scored. Outfielder Kevin Heller also contributed mightily to the victory by slugging his sixth home run of the season, a two-run shot, in the second inning. Heller was 2 for 4 with two runs and four RBI. Catcher Jordan Weems also collected four hits going 4 for 5 in the game. Starter Joe Gunkel was very sharp in the game as well: He yielded seven hits and one earned run in six innings while striking out seven batters. The lone blemish came on a solo home run. The outing was Gunkel's seventh since being recalled from Greenville. A late rally buoyed the Greenville Drive over the Lakewood BlueClaws (PHI) 9-2. The Drive scored eight runs in the final two innings to go on and take the victory. The eighth inning began with back-to-back extra-base hits: a double from center fielder Cole Sturgeon and an two RBI-triple from second baseman Wendell Rijo. The inning's third run came on a fielder's choice. In the top of the ninth, with the score 4-2, the Drive scored five runs. Four of the five runs came on two-RBI doubles from Rijo and Sturgeon. Rijo was 2 for 5 with two runs and four RBI. Sturgeon was 2 for 4 with two runs and two RBI. Left fielder Kevin Mager went deep for his fifth home run of the season. Starting pitcher Daniel McGrath went six strong and gave up only two runs on three hits. He walke four and struck out six. He was relieved by Raynell Velette, who yielded no runs over the final three innings. The Lowell Spinners fell to the Vermont Lake Monsters (OAK) 8-6. Despite jumping out to a 5-0 lead after the first inning, the Spinners could not take home the victory. Left fielder Mike Meyers was 3 for 4 in the game with two runs scored, a triple and two RBI. Cisco Telez and Jordan Betts also had multi-hit games; they each went 2 for 4. The Lowell starter was Jake Drehoff. He lasted only three innings and gave up since earned runs on six hits. The DSL Red Sox defeated the DSL Rojos 8-2. Despite scoring eight runs, the team collected only eight hits and four RBI, although they did walk five times. Two players notched multi-hit games: Juan Hernandez and Roldani Baldwin; they each went 2 for 4 with a walk. DSL starter Daniel Gonzalez was sharp again. The right-hander struck out five and gave up zero earned runs in five innings. He is 8-0 on the season with a 2.76 ERA. The GCL Red Sox dropped both halves of a doubleheader to the GCL Rays. The score of the first game was 8-3, and the score of the second game, which went into extra-innings, was 6-5. Jake Cosart started the first game for GCL, but was pulled after one scoreless inning. He was relieved by Luis Ramos, who gave up four earned runs in four innings. Offensively the squad scratched across three runs on seven hits. Two of the hits came from Derek Miller, who had a run and a double and was 2 for 4. In the second game, the team got 10 hits, and three players had multi-hit games: Miller, 2 for 5 with a run; Javier Guerra, 2 for 5 with two runs and an RBI, and Victor Acosta, 2 for 4 with a run and an RBI. The starting pitcher was Jeffry Hernandez, who gave up five hits and five earned runs in 4 1/3 innings. Player of the Day: Salem Red Sox third baseman Mario Martinez (Pictured) was a huge key to the team's big win over the Lynchburg Hillcats. Martinez, 24, is hitting .279 with 20 doubles and six home runs in 323 at-bats this season in Salem. On Wednesday, he was 4 for 4 with two doubles and three runs scored. Photo Credit: Will Middlebrooks by Kelly O'Connor and Mario Martinez by Goupstate.com.